We help busy families plan amazing vacations to Disney and beyond! We specialize in Disney vacations but can also help you with vacations to Universal Studios in Orlando, Seaworld and other locations in Florida as well as all-inclusive resort vacations and all cruise lines. We take care of every little detail, creating a customized itinerary and touring plan specifically for your family so you can enjoy a stress-free vacation. By specializing in Disney vacations, we can offer you the most up-to-date information on all Disney destinations. We have years of experience with Disney travel. We’ve stayed in all of the resorts, eaten at all of the restaurants and cruised on all of the ships. We know the best and worst times to travel, give honest, unbiased reviews of our personal travel experiences and will help you choose the absolute best options for your family’s Disney vacation. Planning a Disney vacation is a daunting task! Which resort is best for your family? Where should you eat? How long should you stay?How do you get around? What are the absolute must-dos? It’s very overwhelming! For our Disney theme park clients, the Vacation Planners of Starts With A Wish Travel go through a 60-point checklist during the planning process to ensure that you have been given all of the available options for your vacation. For our Disney Cruise clients, we help you select the right itinerary for your family, select the best excursions and book those excursions as well as providing you with plenty of tips for your Disney cruise. Your Disney vacation should be magical – not stressful! Your Starts With A Wish Travel Vacation Planner will make sure that your Disney vacation is not only magical for your children but magical for you as well! Schedule your Personalized Vacation Planning Session using my online scheduler. Review your personalized vacation proposals & select the one that best suits your family. Your Vacation Planner will take care of the planning so you can relax & look forward to your vacation! Now pack your suitcases and get ready to enjoy your magical Disney vacation! Starts With A Wish Travel is proud to be an Authorized Disney Vacation Planner! What is an Authorized Disney Vacation Planner? This is a designation given by Disney that recognizes top vacation planners based on quality of service and expertise in Disney products. Our extensive knowledge of Walt Disney World, Disneyland, Disney Cruise Line, Aulani Resort and Spa and Adventures by Disney products earned us this top honor. Packing for a Walt Disney World vacation can be difficult if you aren’t sure what you will need. You’re busy with work and family and don’t have time to search the internet trying to figure out what to take. It often gets left until the last minute, then you end up stressing out about it and forgetting things. We put together this Walt Disney World packing guide to help busy moms like you know just what to pack. We have packed for Walt Disney World so many times we could do it in our sleep! 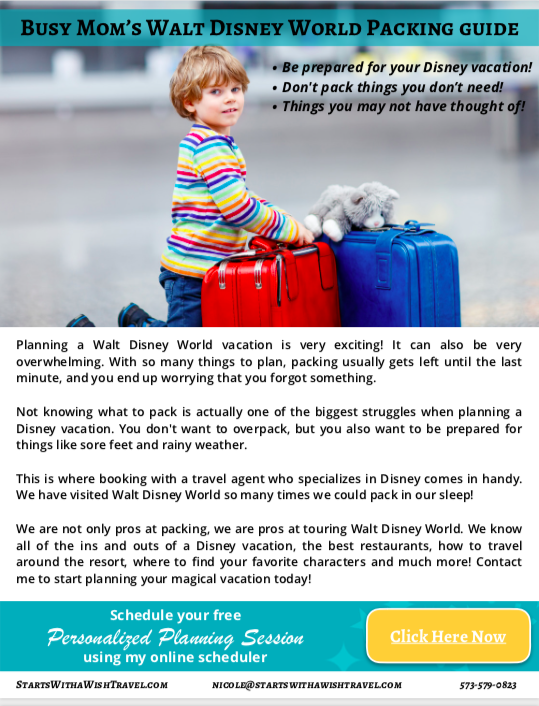 Click the picture to get your FREE Busy Moms Walt Disney World Packing Guide today!